A rendering tribute to Cuban baseball, this book rescues for the sake of history the greatest moments of Cuban baseball. 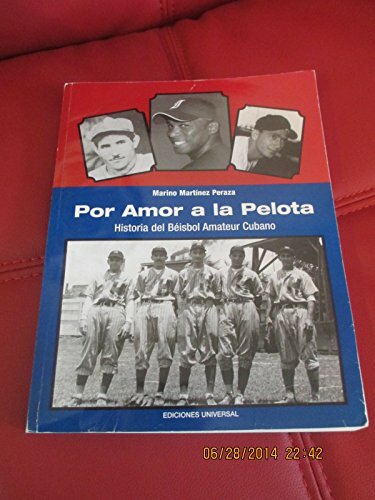 In year by year chronology, the author gives complete information pertaining to the games (national and international) in which Cuba participated as well as biographical information on all the star players. Special emphasis is given to the World Series, Olympic Games, Pan-American, Central American and Caribbean games, as well as Intercontinental Cups. Included are the names of the players in the Hall of Fame, indexes of championships and bibliography. Contains many pictures of the teams and players. Marino Martinez Perazo was born in Guira de Melena, a suburb of Havana, Cuba. In the United States since 1980, he is the sports writer for the newspaper El Nuevo Herald and in his Sunday column Rincon del Recuerdo he writes on the biggest legends the sport. He is a member of the United States Baseball Writers Association and the creator the Cuban Sports Hall of Fame, a non-profit institution that gives tribute to the great figures of Cuban sports. Member of FABA. General stock. Spanish, Children, Novels History, Florida. We would love to have interested, book lovers call and stop by. Prices net. All books returnable within ten days. Payment may be made by check, money order,Paypal,or through ABE's e-commerce; I cannot take credit card payment directly. Domestic shipping by priority mail is $7.50; book rate, $4.50. Florida residents must pay 7% sales tax. International orders: payment must be by Paypal or ABE's e-commerce. (305) 541-9982, 9 pm until midnight best.